Grand Canyon Powerhouse, Grand Canyon NP, 1985. The Grand Canyon Power House is a large reinforced-concrete structure. On the exterior a native stone veneer makes up two-thirds of its height, and exposed-aggregate concrete with a decorative wood cornice and balcony makes up the top third. A smaller wing at the west end of the building repeats the wood cornice, but has no balcony. The gable roofs of the main structure and the wing are covered with rolled composition roofing. The native rock used for the veneer was quarried from a nearby location within the park boundaries. It matches the bedrock of the surrounding area and most of the buildings in the immediate vicinity constructed of the same material. The stones have deeply raked mortar joints and extend extend up to a foot from the wall. Multi-story steel-sash windows break up the rubble-masonry wall surface. The windows have concrete lintels, and concrete spandrels between the basement and upper levels. The original plans called for the lintels and spandrels to be bush-hammered to tie them in with the rough texture of the stone; instead they were left as poured. Some of the windows on the east elevation have been covered with plywood. The corners of the building have quoins--larger corner stones that visually and often structurally reinforce the corners of the building. The building is detailed like a Swiss Chalet, with a decorative cornice below the gently sloped gable roof, and a balcony surrounding a false upper "story." The cornice is made up of doubled non-structural brackets that are bolted into the concrete wall and extend beyond the roofline. In between each of the sets of brackets is a wood trim in a jigsawn "x" pattern which, in some places, hides window vents at intervals along the eaves. The upper concrete walls, which look more like stucco from a distance, are edged with large cornerboards. The industrial steel-sash windows of this upper portion are made to look less factory-like by the large wood moldings that surround them. The balcony that wraps around three sides and part of the fourth side of the building is supported by large stones that cantilever out several feet from the wall. The balcony corners are supported by cast reinforced concrete members whose sharp edges were chipped away to make the concrete look like the rubble masonry of the rest of the structure. The balcony railing has jigsawn patterns cut into the wood: diamonds at the base, and thistle and dart shapes above. The smaller wing at the west end of the building was designed for refrigeration and retains some of its cork lining on the interior walls. Plans for the west wing were completed shortly after those for the main building, so it was probably constructed at the same time. Three windows on this west elevation were filled in with stone at some point during the building's history. The window openings appear on the plans along with some drawings and illegible notes showing a rubble fill. The quality of the stonework and the creative license which the stonemason used in adding a few fanciful patterns in his rubble masonry seem to indicate that the work was completed during or shortly after the rest of the building was constructed, perhaps after some refrigeration equipment was hoisted in through the openings and installed. The main portion of the building's interior is divided in half along the ridge by a glass curtain wall of an industrial steel sash painted green. The original steel columns remain on the interior. The roof structure of steel trusswork with wood decking above is exposed on the interior. Much of the interior has a new structure of space framing and wood decking to add additional floor space for storage. This newer framing is totally removable and is bolted to the historic floor fabric in a few places. It is otherwise self-supporting. Offices at the west end of the building are of newer construction, and are partitioned off with stud walls. The two Fairbanks-Morse continuous-duty Type D Diesel generators, used to supply power to the south rim, remain intact in the building. Above them is a heavy-duty steel crane used to maintain the generators. The switches are reached by the original catwalks above the generators and retain their original labels: Indian Garden Pump; El Tovar; Fire Pump; Bright Angel Lights and Power; USNPS; Train Yard; Turbine Cooling Tower; Power House. All other original catwalks providing access to various parts of the building remain. The only intrusions within the landmark boundary are a gas storage tank at the east end of the building, security lights on the corners of the building, and an electrical transformer on the southeast side of the building. The building's exterior character is that of a Swiss Chalet, interpreted with rustic stonework common to buildings in western national parks, whereas the interior is unquestionably industrial in character: sparse, sensible, efficient, and simple. The heavy, exaggerated, overscaled details of the upper portion also recall California architecture of the time, as seen in the work of architects such as Bernard Maybeck and Julia Morgan. Although the details on this building serve no structural purpose and are only applied ornament, the tie to California arts-and-crafts traditions is evident. The Grand Canyon Power House is the work of a brilliant (and at this point anonymous) architect. The structure is an industrial building in a national park that was constructed in an appropriate style and with appropriate materials. These aspects are interesting but not unique. What is unique about the building is that the architect used multiple techniques of illusion to scale down the massive structure and make it look about half the size that it really is. The building's significance is further enhanced by the extant original equipment used to provide power to the entire development at the south rim of the Grand Canyon. All of it remains in the building; the switches were simply turned off when an alternate source became more economically viable. The Power House was built in 1926 to supply power and steam heat to the Fred Harvey/Atchison, Topeka & Santa Fe facilities on the south rim of the Grand Canyon, and to provide steam heat for the railway passenger cars parked in the Grand Canyon railroad yards. The building was designed in a Swiss chalet style, compatible with El Tovar a short distance away and with most of the other Fred Harvey Company buildings in the vicinity. The use of local stone as the predominant material on the building's exterior linked it further with its natural setting and with its architectural setting. Stone of similar color was used as a primary building material in many of the National Park Service buildings on the south rim. The most unusual aspect of this building is the tromp l'oeuil effect that the architect used. The purposeful overscaling of the windows, balcony, eaves, and the exterior stones in the masonry resulted in the building looking considerably smaller that it actually is. The architect has taken familiar details of a Swiss Chalet and nearly doubled them in size. From a distance the viewer sees the balcony and presumes how easy it would be to stand there with elbows on the top railing to lean out and look at the railroad yard below. In fact, though, the balcony railing is five feet high, making it far more suitable for resting chins than elbows. The upper windows on the front elevation are 6'l1" high; the viewer perceives them as being half that height. The eaves overhang the building by five feet, again about twice what the viewer perceives the overhang to be. The architect also banked the building into a small rise, further decreasing the building's mass when seen from the east, south, and west. In a studied and deliberate fashion the architect has fooled the viewer into believing that the building is actually half its size. The viewer perceives the familiar details and creates the appropriate scale for the building in his own mind without realizing that it is just an illusion. Little is known about the building. The Atchison, Topeka, & Santa Fe Railway gave some of the original drawings of the buildings to the National Park Service, but the set is not complete. None of the drawings is signed by an architect, although one sheet states that it "was made from Mr. Phelps print...". A search through the Fred Harvey records and National Park Service maintenance records revealed nothing about the architect and very little about the building. The only possible lead is that the architect of this building was probably the same architect of the nearby Fred Harvey Company residences on Apache Street constructed about the same time; but, unfortunately, the architect of those buildings remains unknown. The stonework, eave details, low-pitch roofs, general symmetry, and overall quality point to the same architectural "signature." All of the drawings, with the exception of one "as built" footings plan, were completed in Los Angeles in 1925 by a very talented staff architect (or architects?) for the Railway. Grand Canyon became a national park in 1919. In 1924 the Landscape Engineering Division of the National Park Service, under the direction of Daniel Hull, produced a general plan for the development of the south rim of the Grand Canyon. 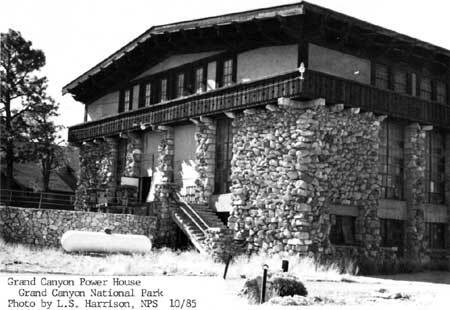 The general plan, approved by the director of the National Park Service, the Fred Harvey Company, and the railway, included a location set aside for a new Power House. Hull at the time was sharing an office in Los Angeles with Gilbert Stanley Underwood (architect of the Ahwahnee at Yosemite and Grand Canyon Lodge on the north rim) who was working for the Utah Parks Company, a subsidiary of the Union Pacific. Hull had chosen Los Angeles as the location for his office because of the available pool of architectural and engineering talent needed for both concessions and park service development. The engineering department of the Santa Fe Railway was also in Los Angeles, and Hull undoubtedly had communications with them before the park service approved the final designs for the Power House. The new Power House was needed to replace an earlier boiler house and pumping plant that could no longer meet the needs of the south rim development. Plans for the new Power House were completed in 1925, and the plant was in operation in 1926. The railway sold the Power House to the National Park Service in 1954, at which time the service contracted with the Fred Harvey Company to operate it. The Power House operations shut down permanently in 1956, and the smokestack was demolished that year. The Fred Harvey Company now uses the building for warehouse storage and a few offices. Changes to the building since 1956 have been minor, and its exterior architectural integrity remains intact as do the diesel generators and switching equipment. Borjes, Ric, and Gordon Chappell. The Grand Canyon Depot and Railroad Yard: 1901-1984. Historic Structures Report. San Francisco: National Park Service, 1984. Henderson, James David. "Meals by Fred Harvey:" A Phenomenon of the American West, Fort Worth: Texas Christian University, 1969, No. 6, Texas Christian University Monographs in History and Culture. USNPS files including National Register files and microfiches of architectural drawings. The boundary is a square measuring 200 feet by 200 feet centered on the building.